Hello Beady Friends! Leah here from Eureka Crystal Beads.com! 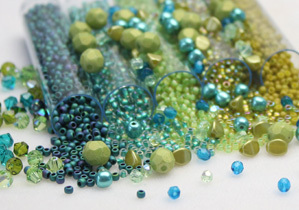 It’s that time again – another beading challenge for you all! January Beading Challenge Theme: Bright New Beginnings! Guidelines: I want to see what you can create in this month’s theme! Bright New Beginnings should make you think of bright colors, bold looks, or jewelry, in general, that makes you feel happy and excited to start a year fresh and new! Interpret this how you see fit – just have fun!!! ***If you’d like to share, I’d love to see what you come up with! Feel free to send a picture of your finished piece(s) (or even unfinished pieces! This is no pressure, right?) over to me via Facebook Messenger on the Eureka Crystal Beads Facebook page! Make sure to let me know if it’s ok for me to share your picture(s) – we plan on putting up a fun album with all your Bright New Beginnings projects at the end of the month! Firstly, who doesn’t love everyone’s favorite bead – the SUPERDUO!! Here are a few of the Superduo mixes I’ve created exclusively for Eureka Crystal Beads that make me think of Bright New Beginnings! And also on the theme of mixes… I love the vibrancy and meaning behind this particular coordinated mix! Does anyone care to show me what stunning projects could be made with it? I think it fits the theme beautifully! Do you think you might need a little extra guidance technically? Eureka offers many kits and patterns! This is one of my favorites that I think shows off lovely jewel tones and sparkle… The ROYAL RIVOLI BRACELET KIT… Offered in 4 different bright colorways completed with all the pieces and step by step instructions! See listings (links below) for additional details. Lastly, have you checked out the 8mm Preciosa Crystal Chatons in sew-on settings? I just love all of the options you have with these little bright gemmy pops of color – and they are pre-set for you! The metal settings have 2 HOLES for many many options!! String them into Soft Flex beading wire or weave them into your most intricate of designs. Pictured here is Fuchsia in a gold tone setting. We also have other color / metal selections as well! If you’d like another idea for how to use them, check out this past blog of mine for the Woven Crystal Chaton Tennis Bracelet! Next Post JANUARY BIRTHSTONE: GARNET!